Pedro, «el Cruel», o «el Justo», rey de Castilla y de León, r. 1350-1369. Enrique II, «el Fratricida», o «el de las Mercedes», «Enrique de Trastámara», rey de Castilla y de León, r. 1366-1367, 1369-1379. King Henry had obtained the victory, then they laid siege round about the castle of Montiel, wherein was king don Peter. Then king Henry sent for the residue of his company to Toledo, whereas they lay at siege, of the which tidings the earl don Tello and the earl Sancho were right joyful. This castle of Montiel was right strong and able to have held against them all a long space, if it had been purveyed of victual and other things necessary; but there was not in the castle scant to serve four days, whereof king don Peter and his company were sore abashed, for they were so straitly watched day and night, that a bird could not come out of the castle without spying. Then king don Peter, seeing himself thus beset round about with his enemies, and knew no way of peace or concord, was in great imagination. So all perils considered and for default of victual, he was counselled to depart privily at the hour of midnight and twelve persons with him, and so to adventure on the grace of God, and guides were appointed to bring him in safe-guard. And so about the time of midnight next after the king don Peter and don Ferrant of Castro and twelve other persons with them departed out of the castle. The night was very dark and the Begue of Villaines kept watch without the same night, and a three hundred with him. Then the Begue stept forth with his dagger in his hand and came to a man that was near to king don Peter and said, “What art thou?” and he rushed forth with his horse from him and passed by them. The Begue stept to king don Peter, who was next, and said, “What art thou? Shew me thy name, or thou art but dead”; and took him by the bridle, for he thought he should not pass from him as the other did. Then king don Peter, who was a right hardy and a cruel knight, advanced himself and said: ‘Nay, thou art a whoreson and I am son to king Alphonso.” And therewith he took king Henry his brother in his arms and wrestled so with him that he overthrew him on a bench, and set his hand on his knife and had slain him without remedy, an the viscount of Roquebertin had not been. He took king don Peter by the leg and turned him up-se-down, so that king Henry was then above, who drew out a long knife and strake king don Peter into the body. Therewith his men came in to help him, and there was slain also by him a knight of England called sir Ralph Helme, who was sometime called the green squire, and another squire called James Rolland, because they made defence; but as for don Ferrant of Castro and the other, had none evil, but remained prisoners to the Begue of Villaines and to sir Yon of Laconet. Thus ended king don Peter of Castile, who sometime reigned in great prosperity. And after he was slain, he was left three days above the earth, the which methink was great pity. Then the next day the lord of Montiel yielded him to king Henry, and he took him to mercy and all those that would turn to him. Then tidings ran over all Castile how king don Peter was slain, whereof his friends were sorry and his enemies joyful. But when the king of Portugal heard how his cousin king don Peter was dead, he was right sorrowful, and sware and said that his death should be revenged. And so he sent incontinent his defiance to king Henry and made him war and kept the marches of Seville against him a certain season; but for all that king Henry left not his purpose in pursuing of his enterprise, but returned to Toledo, the which yielded up straight to him and all the country thereabout. And at last the king of Portugal thought not to keep any longer war against king Henry, so there was a peace made between them by the means of the prelates and lords of Spain. Thus king Henry abode in peace king of Castile, and with him sir Bertram of Guesclin, sir Oliver of Mauny and other knights and squires of France and of Bretayne. And king Henry did much for them, as he was bound to do, for without their help he had not obtained his purpose: and so he made sir Bertram constable of Spain and gave him the land of Soria, the which was yearly worth twenty thousand franks, and to sir Oliver his nephew he gave the land of Ecrette, the which was yearly worth ten thousand franks, and also he gave fair lands to divers other knights and squires. Then the king went and lay at Burgos with his wife and children. Of his prosperity and good adventure greatly rejoiced the French king, the duke of Anjou, and also the king of Aragon. About the same time died sir Lyon of England duke of Clarence, who had passed the sea, as ye have heard before, and had married the daughter of Galeas lord of Milan. But because he died strangely, the lord Edward Spenser his companion kept war against him a certain space, but finally he was informed of the truth. Peter’s rival Henry of Trastámara continuously depicted Peter as “King of the Jews”, and had some success in taking advantage of popular Castilian resentment towards the Jews. Henry of Trastámara instigated pogroms beginning a period of anti-Jewish riots and forced conversions in Castile that lasted approximately from 1370 to 1390. Peter took forceful measures against this, including the execution of at least five anti-Jewish leaders of a riot. The prominence of Samuel ha-Levi, King Pedro’s treasurer, has often been cited as evidence of Pedro I’s supposed pro-Jewish sentiment, but Ha-Levi’s success did not necessarily reflect the general experience of the Spanish jewry in this period which was often marked by discrimination and pogroms. And even Samuel’s career, including his arrest and death by torture, shows that the opportunities for Jews were restricted to certain offices and positions whereas other forms of advancement were denied to them. Henry was as hostile to the Jews as Pedro had been friendly. In order to pay Bertrand du Guesclin’s mercenaries, he imposed a war contribution of twenty thousand gold doubloons on the already heavily oppressed community of Toledo, and issued an order to take all the Jews of Toledo as prisoners, to give them neither food nor drink, and if they still refused to raise this enormous sum, to sell their property, both movable and immovable, at auction. Nonetheless, he was compelled, owing to his financial straits, to have recourse to Jewish financiers. He made Don Joseph Pichon his chief tax-collector (“contador major”), and appointed several Jews farmers of the taxes. The demands of the Cortes in Toro (1369) and in Burgos (1374 and 1377) against the Jews harmonized perfectly with Henry’s inclinations. He ordered the Jews to wear the humiliating badge, and forbade them to use Christian names. He further ordered that for short loans Christian debtors should repay only two-thirds of the principal. Shortly before his death Henry declared that Jews should no longer be permitted to hold public office. Henry was potentially the first ruler since the Visigothic King Ergica to implement anti-Jewish policies in the Iberian Peninsula. He died on 29 May 1379 in Santo Domingo de la Calzada. 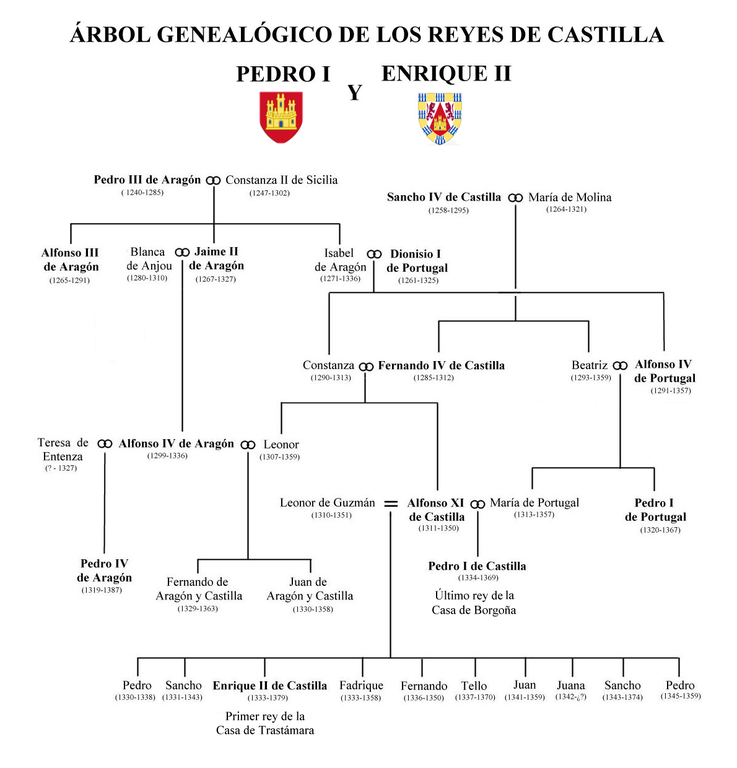 His son John I of Castile succeeded him on the throne.